My ggggg-grandmother, Matilda Slaven, was born in 1790 in Mill Gap, Highland County, Virginia - an area that is now part of Pocahontas County, West Virginia - and died 20 November 1855. Apart from these dates, I know very little about her life. She married a man named John Wade, grandson of Welsh immigrants to Highland County, and they raised twelve children: eight boys and four girls all of which lived to adulthood. Her daughter Elizabeth Slaven Wade married John Sharp, and this is the line that leads to me. Somewhat more is known about the Slaven family ancestors of Matilda, whose history in America begins with John Slaven. John, Matilda's grandfather, landed in NY in 1740. He had come from County Tyrone in Ulster, Ireland, where he was born about 1723. He worked for a time in Philadelphia as a weaver, and was in Sussex County, Delaware during 1746 and 1747. Around that time, he married Elizabeth Stuart, who had been born in Scotland and came to Baltimore and then Delaware as an indentured servant shortly after the great Battle of Culloden in 1745. Her father Daniel Stuart died in Sussex, Delaware in 1777. Daniel was the son of John Stuart and the grandson of Dr. John Stuart, who had come to America some time earlier. In 1777, John and Elizabeth moved their family to Highland County, Virginia near the headwaters of Jackson's River and settled in the Meadowdale Community near what is now Monterey, Virginia. He served at Yorktown during the Revolutionary War. In 1781, John Slaven received a patent for 191 acres in the Meadowdale district.2 His descendants still live on the land. John and Elizabeth Slaven's son Stuart was born in Highland County in 1765, and died 19 July 1833. He married Isabelle Johnson, daughter of Bartholomew Johnson and Isabelle Buchanan, on 27 January 1792. Stuart and Isabelle were the parents of Matilda Slaven. Any records that may have existed to tell the story of the Irish ancestors of John Slaven likely perished in 1922 when the Irish Public Records Office was destroyed by fire. The name Slaven itself, however, has a long documented history in Ulster. Those bearing the name Slaven are said to descend from Colla da Crioch, or Colla of the Two Countries - Eire (Ireland) and Alba (Scotland). Colla was one of three sons of Eochaid Duibhlein of Eire and Aileach, daughter of Updar, a Pictish King of Alba. Colla da Crioch and his two brothers, Colla Meann (the "famous") and Colla Uais (the "noble"), are said to have had the designation "Colla" ("strong man") imposed upon them as a penalty for rebellion. Originally, the three brothers were named Muireadach, Cairsall, and Aodh. The survivng Collas, Colla da Crioch and Colla Uais, assumed control of the kingdom known as "Oirghialla" or "Oriel," with Colla da Crioch as the first king. 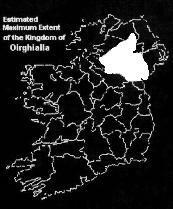 Oirghialla comprised much of the lands of present-day counties Fermanagh, Tyrone, Louth, Armagh, and Monaghan. According to John O'Hart's Pedigrees or the Origin and Stem of the Irish Nation (1892), a huge genealogical compendium drawn largely from the Annals, the Slaven family can trace their lineage directly back to Colla da Chrioch. The Gaelic form of the name, Ó Sléibhin, is said to be derived from the Irish word for mountain ("sliabh").7 From this form evolved the variations O'Slaven, O'Slavin, O'Sleaven, O'Sclevin, O'Slammon, Slieven, Slavin, Slaven, and Slammon, among others. Could it be that nearly 600 years after the death of the ollamh Domhnall Ua Sleibhin, a kinsman, or perhaps even a descendant, named John Slaven departed that ancient kingdom of Oirghialla for the adventure of a life in the unspoiled wilds of the American colonies? 1. Chalkley, Lyman. Augusta County VA Court Records, Order Book VII, page 101. 2. Morton, Oren F. The History of Highland County, VA. 1922. 7. MacLysaght, Edward. More Irish Families. Irish Academic Press, 1996.